Dill, Holger, et al. "Intronic miR-26b controls neuronal differentiation by repressing its host transcript, ctdsp2." Genes & development 26.1 (2012): 25-30. Liu, Hong, et al. "MicroRNA 26b is upregulated in a double transgenic mouse model of Alzheimer's disease and promotes the expression of amyloid β by targeting insulin like growth factor 1." Molecular medicine reports 13.3 (2016): 2809-2814. Li, Jia, et al. 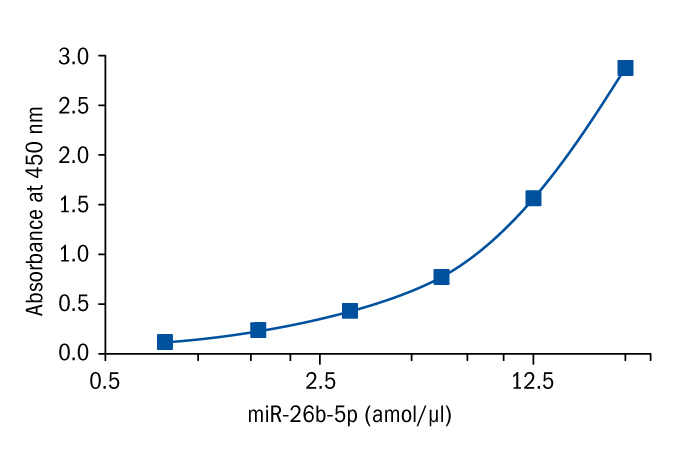 "MiRNA-26b inhibits cellular proliferation by targeting CDK8 in breast cancer." International journal of clinical and experimental medicine 7.3 (2014): 558. Duan, Guoqing, et al. "MicroRNA-26b inhibits metastasis of osteosarcoma via targeting CTGF and Smad1." Tumor Biology 36.8 (2015): 6201-6209. Liang, Naixin, et al. "Down-regulation of microRNA-26b modulates non-small cell lung cancer cells chemoresistance and migration through the association of PTEN." Acta Biochim Biophys Sin 47.7 (2015): 530-538. Fan, Fei, et al. "MicroRNA-26b-5p regulates cell proliferation, invasion and metastasis in human intrahepatic cholangiocarcinoma by targeting S100A7." Oncology letters 15.1 (2018): 386-392. Miyamoto, K., et al. "Tumour-suppressive miRNA-26a-5p and miR-26b-5p inhibit cell aggressiveness by regulating PLOD2 in bladder cancer." British journal of cancer 115.3 (2016): 354. Wu, Ke, et al. "miRNA 26a 5p and miR 26b 5p inhibit the proliferation of bladder cancer cells by regulating PDCD10." Oncology reports 40.6 (2018): 3523-3532. Wang, Duo, et al. "Impact of miR‐26b on cardiomyocyte differentiation in P19 cells through regulating canonical/non‐canonical Wnt signalling." Cell proliferation 50.6 (2017): e12371. Absalon, Sabrina, et al. "MiR-26b, upregulated in Alzheimer's disease, activates cell cycle entry, tau-phosphorylation, and apoptosis in postmitotic neurons." Journal of Neuroscience 33.37 (2013): 14645-14659.